I spatchcocked the last few turkeys I have made and really like how they turned out. They cook much more evenly because all the meat is flattened out. Also, all the skin gets browned up which is just amazing! It’s good to do this the day before and rest on some paper towels in the refrigerator before roasting, but if you are short on time or just have didn’t plan very well, you can totally skip that step. It will still turn out great. The turkey cooks really fast with this method and that is what I love about it. I hope you give this method a try this Thanksgiving. 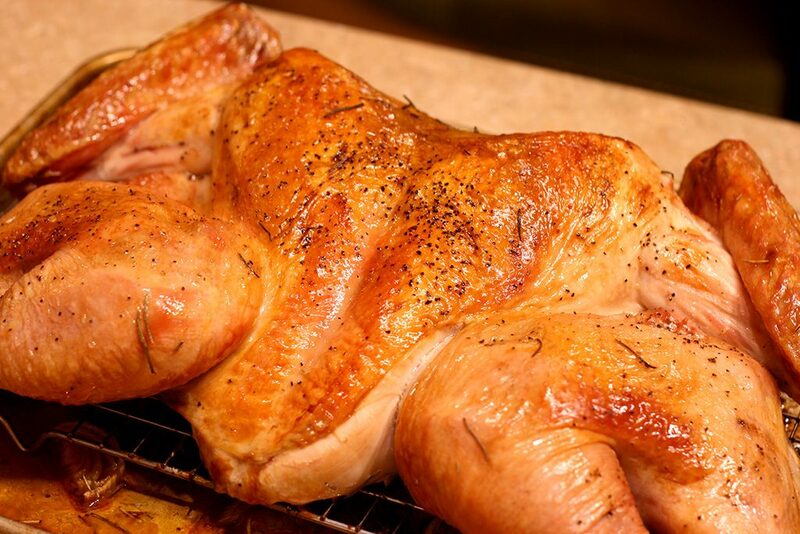 The day before cooking, prepare the turkey, rub with salt, cover, and refrigerate. Using kitchen shears, cut the backbone out of the turkey. You can make things easier on yourself and remove the wishbone with a knife. Open up the bird and flatten it out. Press to flatten. If you didn’t remove the wishbone, you will need to press real hard to break it before flattening it out. It should lay nice and flat. Rub the turkey with kosher salt. 1/2 teaspoon per pound of meat. Put paper towels on a half sheet pan and put the turkey on it. Cover with plastic wrap and refrigerate. Place onion, celery, carrot, and rosemary on a half sheet pan and place a cooling rack over it. Place the turkey on top of the cooling rack and tuck the wings under. Rub lightly with canola oil. 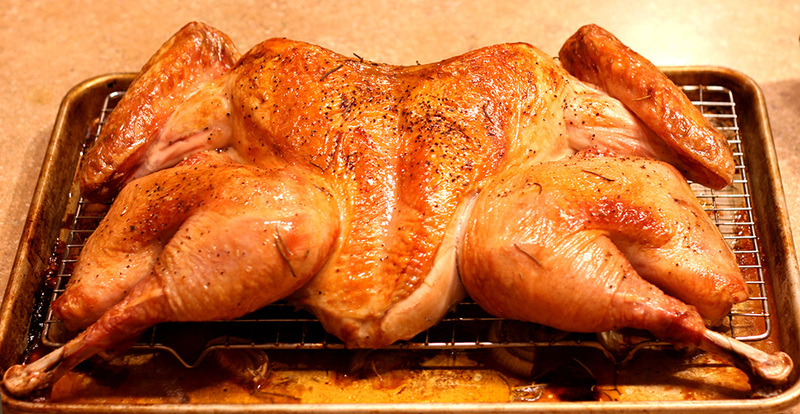 Roast at 450°F until the breast is 150°F-155°F and the thighs are 165°F. Check the temperature after 1 hour. It will take about 1 ½ hours to cook, but watch it closely at the end to avoid overcooking. Remove from oven and loosely cover with foil and a kitchen towel or two. Rest for at least 10 minutes before carving. Save the pan drippings for gravy.